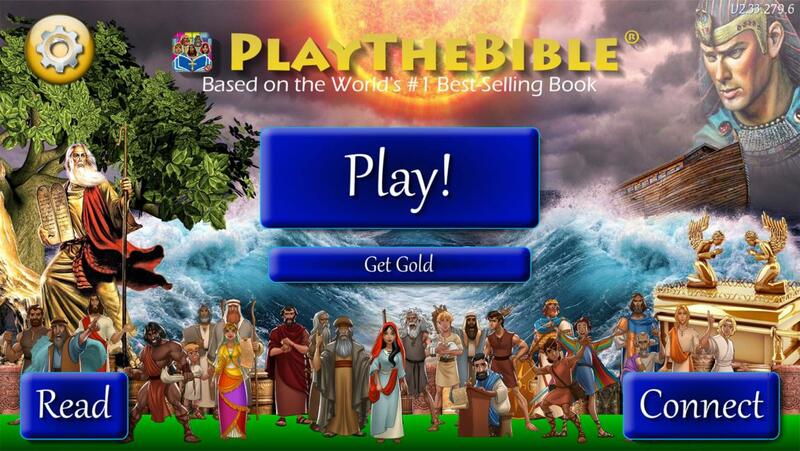 One important feature which differentiates Play The Bible Ultimate Verses from all other Bible-related games is the fact that actual Bible text is, without question, the ‘star’ of the game. The game reads it to you out loud consistently, while the words are in your face continually, in proper order, as you play. The game also has, on average, seven translations per language to appeal to various followers of historical manuscripts. 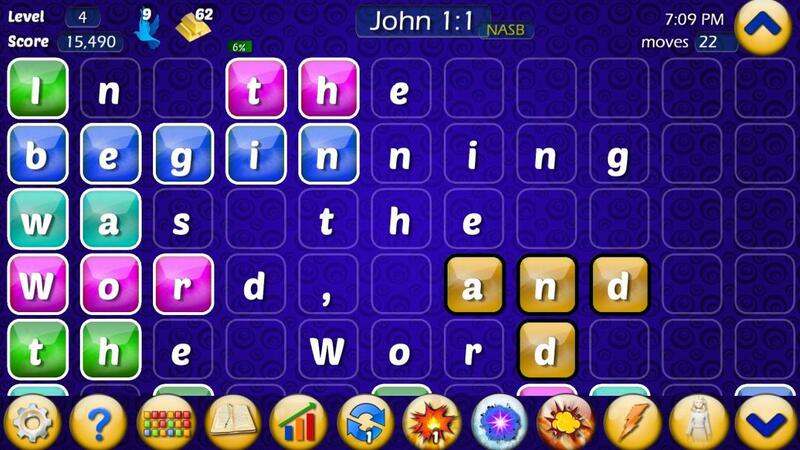 But perhaps what is most interesting features of Play The Bible Ultimate Verses are that the game are that it is ad-free and truly free-to-play. A gamer can pay money to support RD Games or to acquire moves and power-ups, but it’s not required. A gamer never has to pay money to advance to the highest levels. Once a gamer finds themselves without moves or in need of more power-ups, all they need to do is wait about 2 hours at a time, and ‘moves’ will regenerate to their original number. As gamers complete levels, they will earn gold bars and unlock premium features, including the unlocking of characters. Gamers have completed thousands upon thousands of levels without having to pay any money. Of course, we encourage purchases to help finance additional features and future games. PLAY – This large button will take the gamer directly into the action with a single click. CONNECT – This button will give the player an opportunity to earn 50 gold bars by simply registering via Facebook, LinkedIn, Email or other method as we are looking to expand registration options. 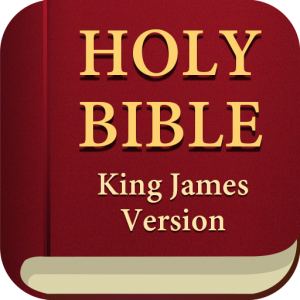 READ – Depending upon the licensed rights and translation chosen by the player, a gamer may be able to read the entire Bible, chapter by chapter, just as in most free Bible apps for Android phones. At the time of this writing, more than 90% of our supported translations enable Bible reading. 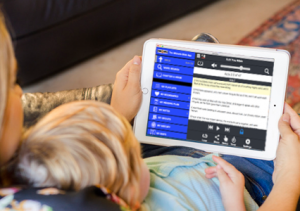 And to make reading easier, we’ve added text-to-speech functionality so the text is reinforced audibly as you read the text. SETTINGS – You can A) share the game with friends and receive gold for every install that uses your customized link; B) add a church to our database; C) choose a different language or translation; D) view the Moses intro again; E) find out how to redeem your spirit points and F) if you haven’t yet registered, you can Connect (register) and earn 50 gold bars. You can also turn sound, music and speech on or off, as well as change the master volume. Once you have clicked PLAY for the first time, you will be instructed to “Press any Tile to Start”. As you select each colored tile, the game will highlight various other tiles that you can move the selected tile to. The Play The Bible Ultimate Verses game will continue to help you in this manner for the first two levels. Keep in mind that if you click tiles too quickly, you should wait for the game to adjust and recommend the proper tiles – otherwise it may confuse you, as it lags behind players who move tiles to quickly without understanding what to do. So, take your time. You will learn how to play in just a couple of minutes. 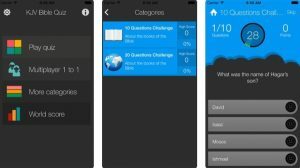 The game has lots of verse-related Bible trivia questions that’s repackaged as a colored tile game and a word puzzle game combined. As you progress through the first 7 levels, you will be introduced to various game power-ups – all of which appear within the bottom icons of the main game screen. These power-ups include Swaps, Fireballs, Icebooms, Electrocons and Lightstrikes. With a Swap power-up, gamers can exchange the position of tiles. This is especially useful when the board gets more filled. The Fireball expands the power of the gamer to score an entire word, without having to individually move tiles to each letter. The Iceball expands this same power to include an entire line of text. The Electrocon goes a step further by empowering a gamer to score 3 lines at one time. The Lightstrike is a useful way to score the entire board quickly and move on to the next level without losing valuable moves. 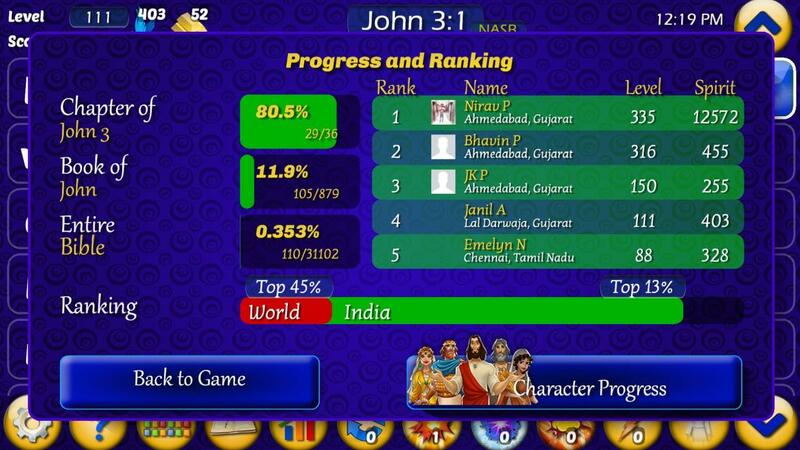 In between every level of Play The Bible Ultimate Verses, gamers can choose to upgrade the number of various power-ups available to them. You can exchange gold or purchase more gold with real money – although optional. Easy-access icons are also available on the main game screen to access other game features including Settings, Help (? ), Cart (Super Bundle Shop), Bible (Navigation) and Progress. After passing level 10, a gamer will automatically see the Navigation choices. After passing level 15, a gamer automatically unlocks an Angel – also available as one of the icons at the bottom of the main game screen icon. You must click the Angel on every level where you want help. She will not help you unless you request her help. If 2 or more colors already exist in a word, she will attempt to move like-colors into the word for you. She works from left to right and when she finishes searching the entire board to help you, she’ll start searching again from the top of the board. To help her the most, place at least 2 matching colored tiles at the back of a word. 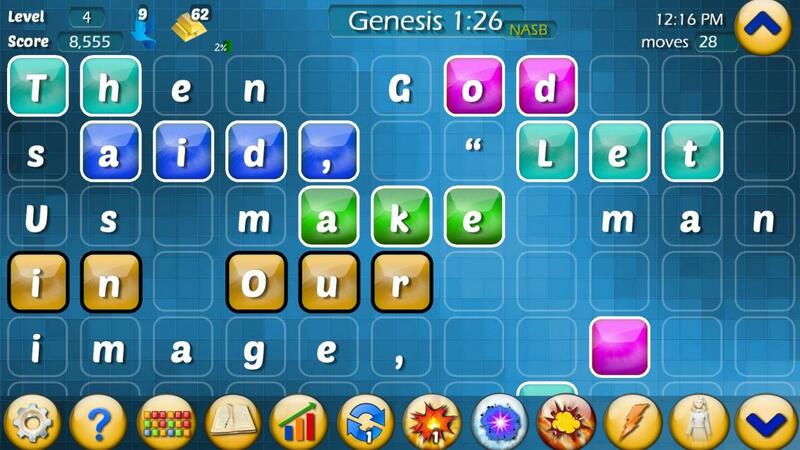 She will then fill the rest of the word, assuming you keep other colored tiles from filling the same word. Once characters are unlocked, gamers will have access to character info and newly written biographies – each statement within every bio has been taken from and verified from scripture. No facts were assumed, and we used verification methods to insure the integrity of content. By doing this, Play The Bible Ultimate Verses includes character summaries of extraordinary quality not commonly found in similar works. 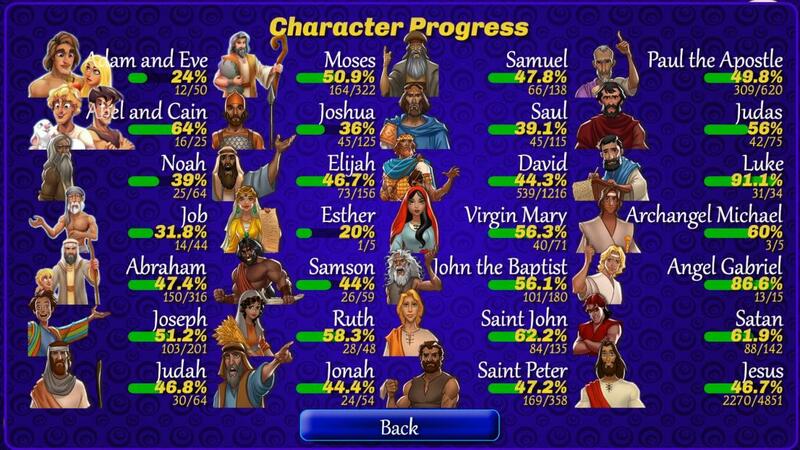 In the Character Progress page, gamers can see how well they are completing the verses relating to each of the game’s Bible characters. After a gamer has registered via Connect, each time they play, they will have an opportunity to view their country and worldwide ranking from the Progress page. Connected games will also have the opportunity to Join or Create (host) a multiplayer version of the game with friends. 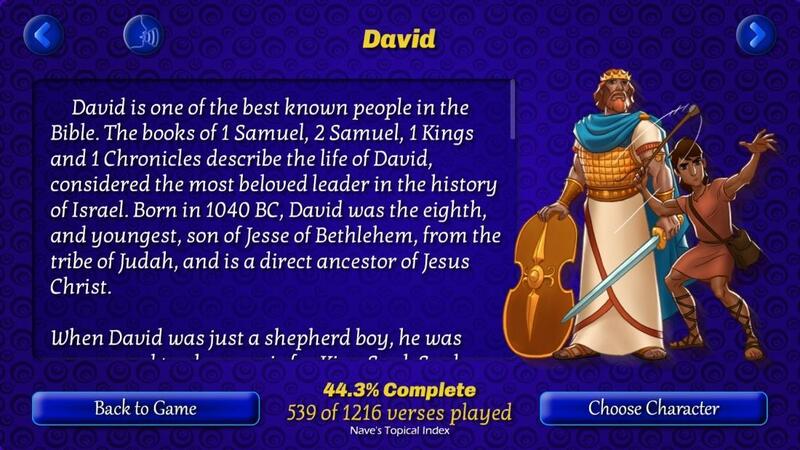 In summary, Play The Bible Ultimate Verses has been designed to provide you with hundreds of hours of fun as you learn scripture in a new, unique gaming experience.